All the saw bodies are manufactured using cold-rolled steel strips quality 75 Cr1 (Material No. 1.2003) bright hardened and annealed to 42-46 HRC. Laser cut saw bodies and expansion slots, using the latest technology. Some saw blade types are provided with cooper plugs in order to reduce the turbulent noise. Extra large European carbide tips. Depending on the specific sawing application the selected submicron grade carbide tips are used for a high resistance and also micro grain structure to obtain the best edge. The carbide tips are braced automatically using Tri-Metal shim providing high tensile strength and impact resistance. 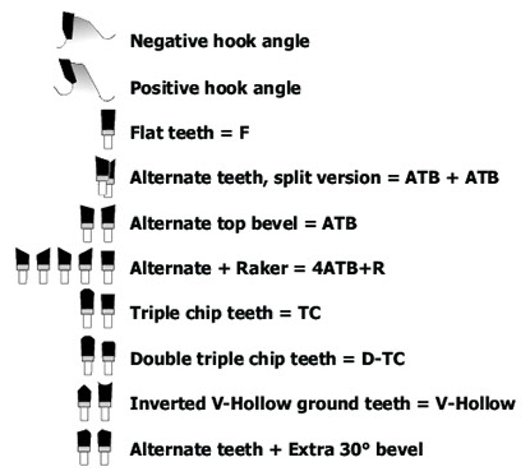 H7 ISO metric tolerance system bore. This ensures the maximum performance of the saw blades by giving a precise tensioning, run out and clearance angles. Use the original packing to transport the saw blade. Select the correct saw blade taking into account the specific material to cut. It is important to chose the correct diameter, number of tips, bore size, and grind according to the information described for each type of saw blade. Also, the feed speed and the cutting speed given by the machine needs to be taken into account. check the saw blade carefully before installing it on the machine. The saw blade has to be in perfect conditions with the correct sharpening. Any saw blade that presents any kind of cracking or broken tips needs to be discarded. Saw blades must be clean regularly to eliminate the build-up of resins and sawdust to minimize friction on the saw plate, preventing overheating and therefore loss of the saw blade tension. The maximum speed described and permitted on each saw blade (n-max) must not be exceeded. When cutting non-ferrous materials, use always coolant or lubrication and damp the material firmly. Check the direction of rotation when installing the saw blade. The machine spindle must be absolutely straight to avoid any vibrations. The machine flanges must be clean and burr free. To obtain better results, it is recommended that the saw flanges must be at least one third of the diameter of the saw blade. The machine needs to be operated with the proper saw guards in place. Always use eye protection. 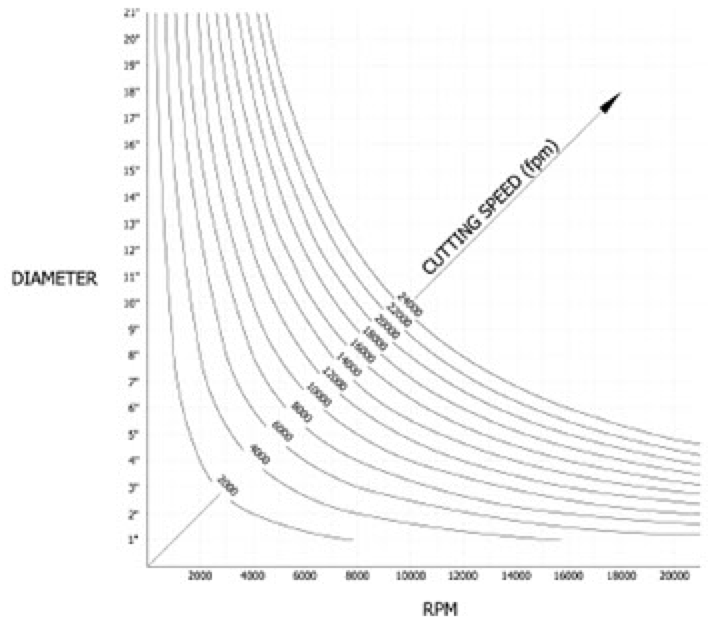 Cutting Speed calculated in feet per minute (fpm) derived from the saw blade diameter and the RPM. *Some Items or/ and Drawings of this catalog may vary due to technical improvements. *For additional technical information contact us.